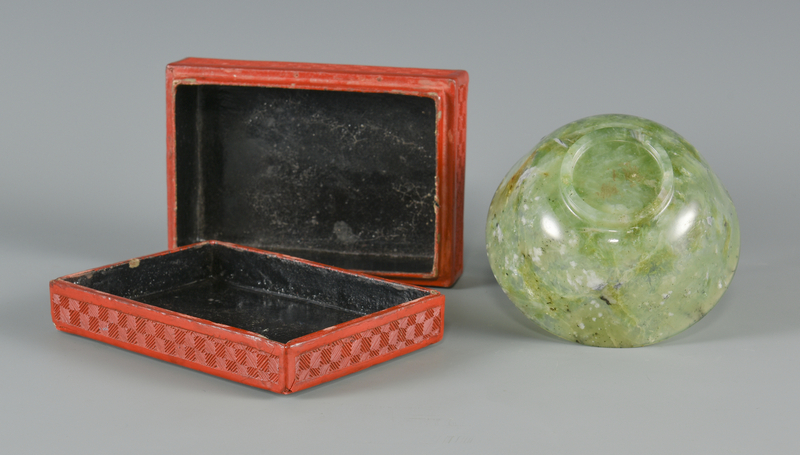 1st item: Chinese carved cinnabar box with inset carved white hardstone plaque to the top. 2" H x 5" W x 3 1/2" D. Late 19th century. 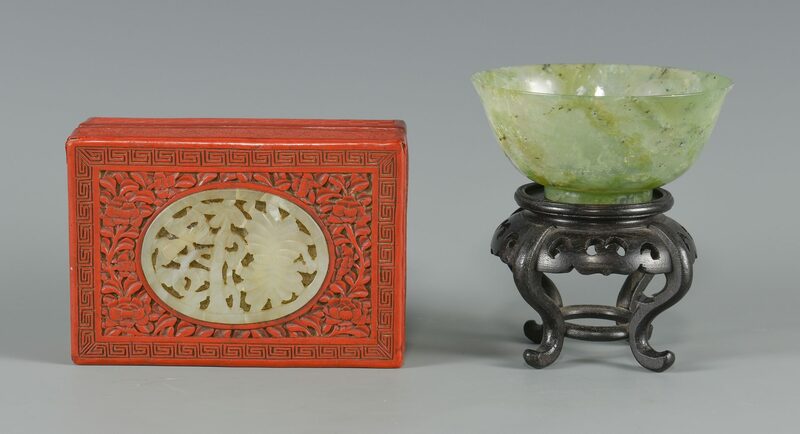 2nd item: Carved Chinese celadon hardstone bowl with some natural inclusions and hardwood stand. Bowl measures 1 7/8" H x 3 7/8" dia. Early 20th century. 3rd item: Carved Chinese green jade figure in the form of a recumbent camel. Fitted with a hardwood stand. Camel measures 2 1/4" H x 5" L. Late 19th/Early 20th century. 4th item: Chinese carved spinach jade snuff bottle, double gourd form. 2 1/2" H. Early 20th century. 5th & 6th items: Pair of Chinese miniature cloisonne quail with hardwood stands, housed within the original decorative box. Birds measure 2" H x 2 1/2" W. Box measures 3" H x 5" W. 20th century. 7th item: Chinese enameled snuff bottle with raised peacock decoration on a green ground, flattened ovoid bottle form. 2 7/8" H. Early 20th century. 8th & 9th items: Two Chinese carved miniature animal figures, rabbit and turtle. Ranging in size from 1 1/2" L to 2" L. 20th century. Provenance: Knoxville, TN collection. CONDITION: 1st item: Scattered wear and chips, mostly to corners of top and box. Repaired breaks to jade plaque. 8th & 9th items: Chip to one ear and to nose of rabbit. All remaining items very good condition.